Pep Guardiola believes he will be branded "a failure" by his critics if he does not win the Champions League with Manchester City after claiming he has become a victim of his own success. 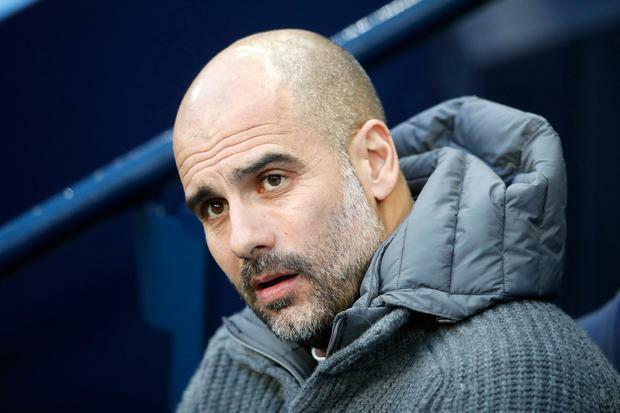 Guardiola's reign as Bayern Munich coach was considered a disappointment in some quarters, despite winning three Bundesliga titles, because he failed to lift the European Cup, exiting at the semi-final stage in each of his three seasons in Germany. And Guardiola, who won the competition twice with Barcelona, is convinced that there will be people who judge his tenure at City in the same way if Champions League success is not forthcoming. "I was judged in Munich in that way so I will be judged here as well," Guardiola said after City were paired with Tottenham Hotspur in the draw for the Champions League quarter-finals yesterday. "My period in Munich was not good for most people because we didn't get to one final. We got to semi-finals but we didn't get a final and we were judged. My standards are high. I have to reach it." City's meeting with Spurs means they face English opposition in the last eight of the Champions League for the second season running after losing to Liverpool last year. Manchester United must take on the might of Lionel Messi and Barcelona in their quarter-final in a return to the Nou Camp for caretaker manager Ole Gunnar Solskjaer, 20 years after scoring the winning goal in the 1999 Champions League final against Bayern. Should United follow up their round-of-16 win over Paris St-Germain by beating the Spanish champions, Liverpool could lie in wait in the semi-finals. The Merseyside club must first overcome Porto, whom they crushed 5-0 on aggregate in the knockout stages last season, in what appears the most favourable quarter-final draw of the four English teams. City, who have already won a second successive League Cup this term, are bidding to become the first top-flight side to retain the Premier League title for a decade and the first English team in history to win a quadruple. They play Swansea City in the FA Cup quarter-finals at the Liberty Stadium tonight. But Rio Ferdinand, the former United and England defender, claimed this week that Guardiola's reign "will be defined by whether City win the Champions League or not" and said it would be "frowned upon" if he fails to - a judgment the Catalan said he would have no choice but to accept. "Everyone can judge if it's a disaster - if we do not win the Champions League, our work for three seasons, every three days, is a failure or a disaster," Guardiola said. "I completely do not agree but what can I say? "We won a lot in the past and that's why people believe that is normal but it is not. There are six (leading) teams in the Premier League and all of them are in quarter-finals (Arsenal and Chelsea in the Europa League). Two of them next season will not be in the Champions League. "Going through the group stage - incredible success. Quarter-finals - incredible success. My standards are not thinking, 'We are Manchester City, we have to win everything. We have to win the final and if not it will be a disaster'. It will be a disaster when you don't do what you have to do - (that is) put in absolutely everything to try it. "When I spoke with my chairman, CEO, sporting director, the people here working know, and they give credit for what we have done in the last two seasons. That is the most important thing." Should City beat Swansea and overcome Spurs in the Champions League, they will have to play a total of 14 matches in just six weeks, a huge workload for Guardiola's squad, which is why the manager said his one hope was that his players avoid injuries over the international break. "What I want is everyone coming back fit and then we can look to arrive fit for these games over the next month and a half," he said. Meanwhile, Guardiola is convinced he has enough quality in his existing squad to withstand a potential two-window transfer ban from Fifa, who are investigating City over allegations of flouting rules around the signing of U-18 players from overseas and breaching third-party ownership regulations. City have not commented on the specifics but say there is an "organised and clear" attempt to damage their reputation.